Biofeedback may sound quite technical and even invasive, but it’s actually a very gentle form of mind-body medicine. It works by teaching adults and children to listen to their bodies and then gain mental control over physiological responses to improve health. When treating migraine and tension headaches, it trains the person to control muscle tension and blood flow patterns which can trigger an attack. Precise instruments are used to measure physiological information, such as skin temperature, which is fed into a computer for the patient to view in real time. The person can watch the screen and try to raise their skin temperature by changing their thoughts or feelings. Increased blood flow warms skin temperature. Over time this encourages the opening of blood vessels and better blood flow to the head, thus reducing the incidence of vascular headaches. Other disorders that can benefit from biofeedback training include urinary incontinence, irritable bowel, ADHD, anxiety, various pain conditions, hypertension and more. Many high quality studies have found biofeedback to be very effective in treating tension headaches and migraines in children and adults. It has also been found to be as good, or even better, than drug therapy. Many experts recommend it as a first line of treatment before starting medications. 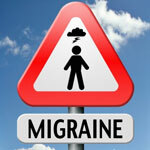 While it may be very effective for some forms of migraine pain, it has been found to be less effective for cluster headaches and when migraines are caused by trauma or are menstrual related.